"This skull belonged to a soldier of the 54th Massachusetts Volunteers, an African-American unit that took part in a July 1863 assault on Fort Wagner in Charleston Harbor. The regiment sustained 272 killed, wounded, and missing during the attack. 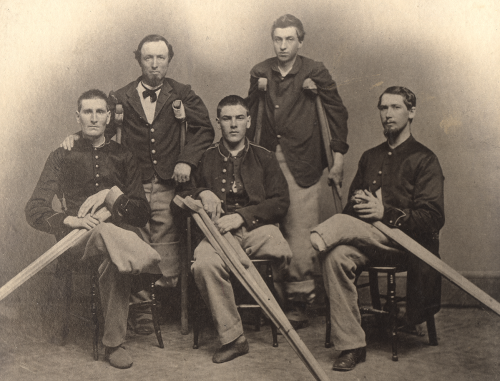 Diseases contracted during the Civil War killed over twice as many men as bullets. Infections spread rapidly in overcrowded camps. Measles, mumps, rubella, and chicken pox ran rampant, particularly among newly-enlisted soldiers from rural areas who lacked immunities from prior exposure. But even more fatalities resulted from dysentery and diarrhea contracted due to unsanitary conditions. The hollow base of the cone-shaped minie ball (named for French inventor Claude Minié) expanded when the gunpowder ignited, thereby catching its grooves in the interior rifling of the gun and increasing the velocity and accuracy of the bullet. The longer, effective firing range of minie balls also turned mass infantry assaults into mass slaughter until military tactics caught up with the destructive power of the new technology. The ubiquitous minie balls have been collected as battlefield souvenirs ever since. Over half of the soldiers killed during the Civil War were never identified. This changed the American Psyche in many ways, Among the changes we owe to the Civil War are the creation of national cemeteries and the birth of a duty to identify dead soldiers and notify their next of kin. Living History day at Southwestern Illinois College in Belleville Monday, April 30, 2012. Union forces from the 3rd Illinois Cavalry along with members of the Lt. George E. Dixon Camp #1962, Sons of Confederate Veterans gave students a unique opportunity to learn about our heritage. Union forces from the 3rd Illinois Cavalry along with members of the Lt. George E. Dixon Camp #1962, Sons of Confederate Veterans gave students a unique opportunity to learn about our heritage. Last year marked the 150th anniversary of the first gunshots of the Civil War -and the first gunshot wounds. As it turns out, the bloodiest war in American history was also one of the most influential in battlefield medicine. Civil War surgeons learned fast, and many of their MacGyver-like solutions have had lasting impact. Here are some of the advances and the people behind them. By Chip Rowe, from the November-December 2011 issue of mental_floss magazine. James Dana Benton, from the north end of Cayuga County, was an assistant surgeon in the Civil War serving from the summer of 1862 to the end of the war in 1865. The new book “A Surgeon’s Tale: The Civil War Letters of Surgeon James D. Benton,” edited by Christopher E. Loperfido, describes Benton’s life and service as a surgeon with Cayuga County’s own 111th and 98th New York infantries. The Benton family originally moved west to the town of Ira from New England in the early 1800s. On a recent annual trip to Gettysburg sponsored by the Auburn/Cayuga Community College Alumni Association, I learned much about the 27,000 Union casualties of the Gettysburg battle and how they were cared for. Hospitals were crude, doctors and surgeons were few, and women were called upon to help with the wounded. Clara Barton, Amelia Hancock and Dorothea Dix were among those who began their healing here.